Whether you’re just beginning to build a system of intervention or working to fine-tune your existing practices, this collection of resources guarantees to extend your knowledge even further. 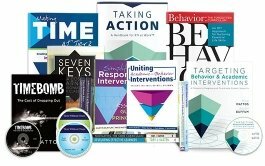 Designed by proven RTI experts, this curated kit includes nine books and five DVD sets that will help your school ensure learning for all for years to come. Build a comprehensive library of premium staff resources on RTI that easily adapt to meet the needs of your school or district. Discover research-based solutions for tackling any RTI challenge. Deepen your understanding of how to counteract a toxic culture while motivating students to succeed.